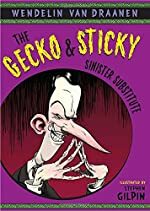 Review: Humor, suspense, and excitement, these are three topics that appear in the book The Gecko & Sticky Sinister Substitute. This book is written by Wendelin Van Draanen and illustrated by Stephen Gilpin. The main characters are Dave (a schoolboy with super powers), Sticky (Dave’s talking pet gecko), Ms. Krockle (Dave’s horrid science teacher), and Damien Black (Sticky and Daves arch nemesis and master of disguise). Dave attends Geronimo Middle School. The Gecko & Sticky Sinister Substitute is the most recent book in the series of three books. It all starts when Dave notices that Ms. Krockle, his wacky science teacher, is absent. A very much odder event was that she is absent on dissection day. Even odder on top of that is the substitute. He looks familiar, but Dave can’t identify him by name. Although Dave can’t Sticky can see right through his disguise. The substitute is Damien Black. Damien Black has been trying to get a magic wristband and his gecko back from Dave. Damien Black keeps returning day after day in different disguise. Sticky thinks that Damien must have temporarily kidnapped Ms. Krockle for his purposes. How does Dave fit this dilemma? What will happen to Damien? There are a lot of unanswered questions. This book was amazing and very cool. This is one of those books where once you have read it, you wish you had one of the character’s lives just for awhile. After finishing the book you have vivid dreams for weeks, because the book is so descriptive. An example of this description is in the book when it says “Ms. Veronica Krockle had never seen eyes as deep or as dark as Damien’s. They were like pools of ink or orbs of onyx.” In addition to the book being every descriptive it is also like riding a rollercoaster in the dark; you don’t know what is going to happen next. One moment there is hate that saturates the air, and then suddenly love melts their hearts. This book also keeps you on the edge of your seat. An example of this is in the book it says “Damien had the spark of a new idea.” What could this idea be? This book is also insanely funny. An example of this is in the book is when it says “And now Damien was, hose to nose with a vacuum so strong it could whisk him through a painful plop into a man- eating dragon’s sand pit.” Once you read the first chapter you have to read on because the characters and setting are so interesting. Both young and old people will love to read this humorous, fiction. Once you start reading you just can’t stop because there are points at the ends of chapters where you can’t stop. This book is also cool because Sticky Dave’s pet gecko speaks Spanish! Finally, this book also makes for a good learning experience. What else could you ask from a book? We would like to thank Random House for providing a copy of THE GECKO & STICKY: Sinister Substitute for this review. Have you read THE GECKO & STICKY: Sinister Substitute? How would you rate it?